Zagg isn’t a stranger when it comes to making keyboards for various mobile devices. Although, taking a clear look at its selection online, the good majority of them are for the iPad. 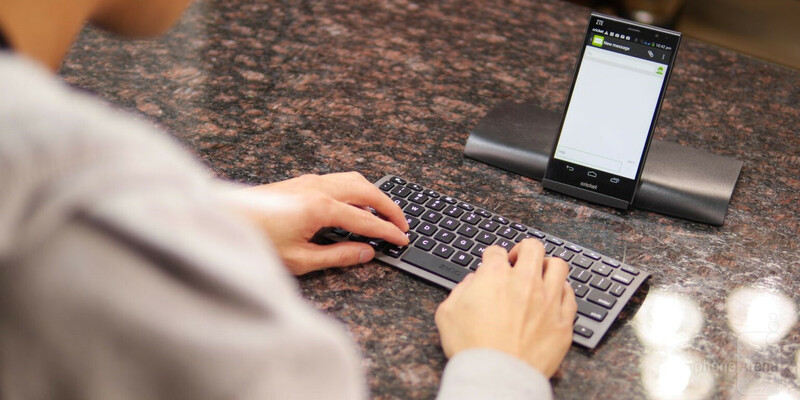 There are some models made for specific Android tablets, but the Zagg Universal keyboard aims to please an even broader range, as this Bluetooth enabled keyboard is made to work with all sorts of devices – so that includes Android, iOS, and Windows gadgets. Generally speaking, Zagg’s line of keyboards tend to feature folio styled designs, but seeing that this one is made to work with all sorts of devices, it’s just a simple and portable one that has its own protective cover. First and foremost, we have to mention out how exquisitely lightweight it is – almost to the point of making us question if there’s anything inside of it. It’s so evident to the point that it makes us feel that it’s somewhat hollow. Well, that’s obviously due to the plastic material it’s sporting, which despite giving it that feather-like feel, it doesn’t necessarily give it any substance. Essentially, it feels cheap. Sliding off the front cover, which also has a pop-out stand to accommodate all sorts of devices, we’re greeted to the island-style buttons of the keyboard. They’re raised and have enough spacing in between to minimize accidental presses – and there are dedicated buttons to launch certain services. For example, we have buttons for copy, paste, and various media controls along the top row of buttons. In addition, it’s great that there are navigational keys as well to make the process of placing the cursor a breeze. In our experience, it didn’t take us long to get a feel of its layout and response – so we’re able to quickly jot out passages of text with few mistakes. Talk about longevity! Zagg claims that the Universal Keyboard can provide up to three month of battery life in between charges. For $69.99, however, we find the price to be just a smidgen more than we’d like. Sure, the portability and universal support is great, but it honestly doesn’t feel too solid with its construction to warrant its price. Not many are backlit in these price range. I do like the fact that their cover can double up as a stand.